At present, there are two types of mass spectrometry used for molecular weight analysis: Matrix-assisted laser desorption/ionization (MALDI-TOF) and Electrospray ionization (ESI-MS). The two methods have their own advantages and applications. MALDI-TOF can be used to directly measure the molecular weight of biopharmaceuticals, while ESI-MS analyzes multiple charge signals obtained by electric spray, and speculates the precise molecular weight through deconvolution. MALDI-TOF-MS is more suitable for analyzing biopharmaceuticals with molecular weight less than 25kDa. ESI-MS is recommended for molecular weight identification of protein substances with molecular weight of larger than 25kDa. MtoZ Biolabs has established a platform with both MALDI-TOF and ESI-MS technologies, which can be used to determine the molecular weight of all kinds of biopharmaceuticals, including antibodies, vaccines, proteins drugs, and polypeptides. Sample requirement: the sample should be dissolved in the volatile solvent with a low content of salt and detergent. Transportation of samples: freeze-dried protein samples, transported at frozen or 4 ℃. MALDI can analyze molecular weight of protein sample and the presence of polymers in protein or peptide segments in protein. 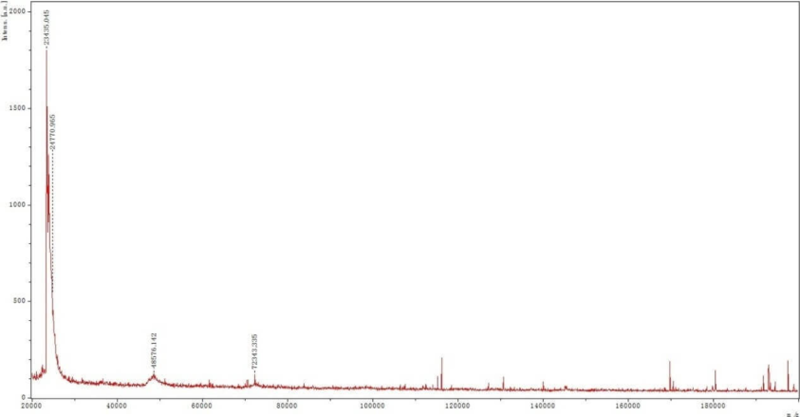 The following is an actual result of determination of the molecular weight of a protein drug. We can see from the graph that there are dimers and trimmers existing in the protein sample.